Artists Rick and Laura Brown are not Jewish and not Polish, and yet they set out to rebuild Gwoździec, a magnificent wooden eighteenth century synagogue in Poland that was later destroyed by the Nazis. Their vision inspires hundreds of people to join them, using their hands, old tools and techniques to bring Gwoździec’s history, culture, science, and art back to life. 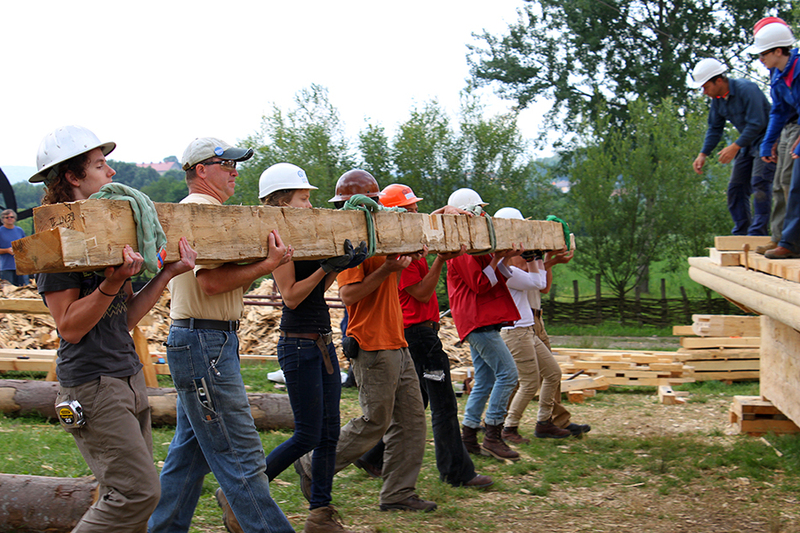 Raise The Roof follows the Browns and the Handshouse Studio team to Sanok, Poland, as they begin building the new Gwoździec roof. The crew has only six weeks to hew, saw, and carve 200 freshly logged trees and assemble the structure. Working against a seemingly impossible deadline and despite torrential downpours and exhaustion, the team must create the structure, and disassemble it again for shipping and eventual installation. Armed with pigments and rabbit skin glue, the Handhouse team sets up to paint the ceiling mural in what seems to be an art gallery in Rzeszów, Poland. In fact, this building and those in seven other Polish cities where they will work during the summers of 2011 and 2012, are all former or active masonry synagogues. Each Handshouse-trained painting leader is tasked with creating the mural’s most iconic images, training students to paint thousands of flowers and vines and greeting visitors—creating a community throughout Poland. In the city of Szczebrzeszyn, Evelyn Tauben paints a flower honoring her great aunt and namesake, Bluma, a Holocaust victim, explaining that she joined the project to encounter Poland in a generative way. When student Ariel Rosenblum agrees to paint the many inscriptions that wrap the mural, Ania Michalska, a Wrocław University Jewish Studies major, jumps in to help. Together they face the Rabbi of Poland and successfully defend their reconstruction of the texts. Raise the Roof provides a window into a time period that is often clouded by fictional representations like Fiddler on the Roof, and overshadowed by the tragic realities of the 20th century. Raise the Roof, visits Warsaw in mid-January where Barbara Kirshenblatt-Gimblett, the Program Director at the Museum of the History of Polish Jews, is walking among the impressive gravestones of the Okopowa Street Jewish Cemetery in deep snow. She brushes snow from an intricately carved tombstone and explains that 70 percent of the world’s Jewish population can trace its ancestry to Poland. The reconstructed Gwoździec roof is now the centerpiece of the POLIN Museum of the History of Polish Jews, which opened its doors to the public in October, 2014. Why did they build out of wood instead of masonry? How did an American turkey and African ostrich come to be painted inside a synagogue in a small Polish village? Raise the Roof takes us on a journey of discovery. Follow our production blog at Trillium Studios. After several days of concerts, seminars, festivals and hoopla, the core exhibition of the Museum of the History of Polish Jews — the most ambitious cultural institution to rise in Poland since the fall of Communism — will be unveiled on Tuesday. Poland’s top political leaders will be there, as will the president of Israel and other international dignitaries. The institution has been embraced across the political spectrum and has drawn only scattered, mild protest. Laura and Rick Brown of Handshouse Studio share their thoughts while completing Gwozdziec Synagogue roof and bimah reconstruction project. Click on the photo for a short video interiew. Rick and Laura Brown and Jason Loik arrived in Warsaw, Poland in early March to install the Bimah below the Gwozdziec Synagogue roof. Cary Wolinsky joined them to film the install and photograph the ceiling and bimah together before the other exhibits made it impossible view. Raise the Roof is distributed by the National Center for Jewish Film.